When you buy whole lobsters, you’re getting more than just the tail and claw meat. Within the body and legs can be found a lot of good flavor, as long as you know how to extract it. 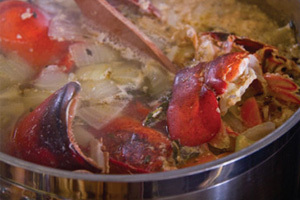 Here’s the technique for taking the cleaned lobster bodies (minus their claws, tails, and innards) and turning them into lobster stock for use in sauces, soups, and other dishes. Tear or cut up the lobster bodies into large chunks and sauté them in a little oil over medium heat until their shells turn orange, stirring occasionally. Move the toasted shells to a stock pot and crush them lightly with a wooden spoon. Continue to brown. Drizzle in the cognac, then add the carrots, celery & onions. Sweat briefly to start the vegetables cooking down, then fill the pot with water. Add the thyme & fennel. Simmer for 1 hour, stirring occasionally. Strain out the solids & discard them. Use the stock in recipes or chill/freeze for later use.